How to choose, and what trends to act on. Our floors are high-traffic, highly visible areas of our home. They either work for us or against us—trapping dirt and stains that force us to spend Saturdays steam cleaning, or facing our brood with style and grace while we live our lives. 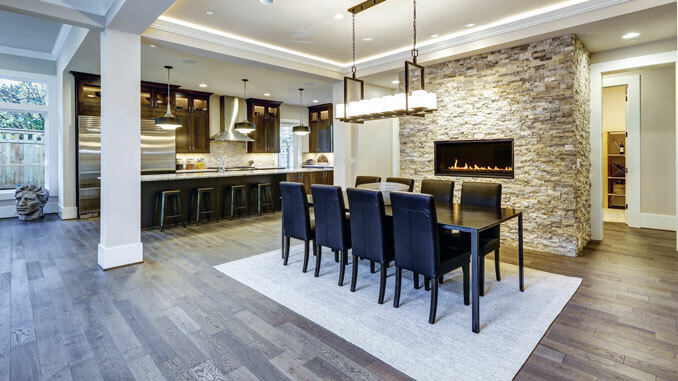 Choosing the right flooring for your home and family is much more than “that looks pretty!” Several other factors come into play, like budget, durability, moisture, location, square footage, installation, maintenance, and more. “It really starts with a budget, but there’s always a floor for every budget,” says Tom Mathews, Director of Operations at Shelton Lee Flooring in Modesto. He explains that identifying your square footage budget is an important and efficient first step because, “…you can outprice yourself, waste your time, and like something you can’t afford.” He suggests you choose a budget for each room, and make that number somewhere in the middle, with a little bit of give on top and bottom. Consider your family. Do you have children and pets? If you do, you probably are strapped for time, which answers the next question—are you into low maintenance? Have the best of both worlds and choose accordingly per room. Typically, hard surfaces are found in the common areas, like the kitchen and bathroom, with soft surfaces in private areas, like the bedroom. Now, who’s going to install this flooring once you’ve made your decision? Sure, you can cut costs if you DIY, but if you’re opting for flooring outside of laminate or vinyl, it’s best to call in the experts. Wood floors, hardwood, ceramic, and tile can be self-installed, (with “can” being the key word here), but the possibility of Pinterest-esque disasters are very possible. Luckily, the host of home improvement businesses in our area is more than happy to send professionals to your residence after you’ve left their showroom with the perfect pick. Wood flooring remains popular, but 2018 is all about wide planks! 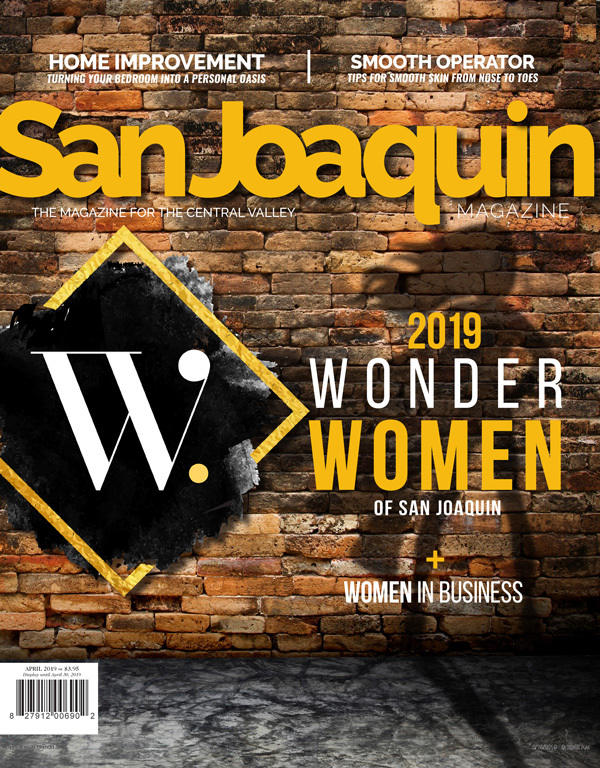 “At seven or eight inches,” adds Jackie Embery, Showroom Manager at HT Home Design in Stockton. Some are opting for a foot or even wider! This look perfects shabby chic, wine country flair. Colored wood is high on the interior design radar, with medium, one-tone, wood, and natural colors. Neutral color palettes are the name of the game this year, with beiges, whites, and light and airy colors heading the trend. “This creates a cozier, more relaxed feel,” Jackie adds. Another great trend for wood lovers is the switch to a wax finish instead of polyurethane. As Jackie explains, “It allows for re-apply of the wax, which makes the floor look like new again!” “The wax comes in a matte finish, a drawback to the casual feel we’re seeing now,” she adds. Du Cahteau Floors, a brand carried at HT Home Design, hits the trendy nail on the head with a natural look, and a series that features reclaimed lumber. These floors come with that wax finish, a variety of colors to choose from—ranging from almost burnt or black, to white—and a wide array of textures. “The colors in this line are fantastic!” Jackie raves. For the traditionalist, fear not! HT Home Design carries LM Flooring, who offers a massive variety of traditional styles. Today’s technology allows us to seriously mimic the beauty of natural wood without the moisture, and wear and tear sensitivity. “It’s everywhere!” says Tom of Shelton Flooring. And the keyword for Wood Plastic Composite (WPC) is waterproof, people! “Every manufacturer is coming out with it and marketing it as such,” Tom adds. Though he says no floor is truly waterproof, this is the closest you can get. WPC also boasts an excellent price point, wide variety of styles, easy installation, and no need for an underlayment, as pads are often attached. Perfect for the kitchen, this mock-wood is upscale and trendy, without high maintenance needs. No Bona or Swiffer and expensive specialty cleaners needed here—just a good old-fashioned mop and neutral pH cleaner. Light, airy colors spill over into 2018 tile trends as well, with a resurgence of bright white tiles. Picture gorgeous white floors contrasting against dark espresso cabinets. And, speaking of contrast, this year is continuing the trend, with hexagon tile flooring. What used to be a vintage and classic look, is now super-modern, sleek, and minimal—with white, grey, and black tiles varying in size and boasting clean, sharp lines. Art Deco returns with its terrazzo tile, the ultra-fashionable marble mosaic. This look boasts marble without the full-blown price tag. Choose from pastels, bright colors, or rich dark chunks of marble accented in warm gold. As it’s always classic, tile, too, mocks the popular wood option, with wood effect tiles that boast all the durable, strong, characteristics of tile. Chevron tiles are all the rage this year, bringing a fresh look and arrangement to this tried and true option. “Rugging” is becoming popular in tile work, where many homeowners opt to have an arrangement of patterned tiles built in like a rug, surrounded by plainer tiles that cover most of the floor—creating gorgeous color and contrast. This is a great option for under the kitchen or dining room table, ridding you of any area rug hassles. Look to Dixie Home Group, carried by Shelton Flooring, for an excellent line that offers every consumer a price point—with three different carpet lines. “Gorgeous patterns, beautiful manufacturing, commercial backings!” Tom raves. “They use old style dying method; no mass production here. And that means more solid color for your pieces.” Fun fact? That solid color also helps with stain resistance, because a full fiber is less likely to absorb a stain.